Quilt Squares, originally uploaded by Leah Virsik. I’ve been working on this quilt and I can’t say I love it and I’m not sure this is how it’ll end up. I think it actually looks better in the photo than it does in real life. We’ll see… I’m out of my comfort zone and I don’t want to finish… I would easily quit except I have one last class to finish up and I don’t want to be a slacker. This is that difficult part that I don’t so much enjoy but I’m in the middle and putting myself out there. I imagine other people can identify. Lots going on… here’s my promised update from yesterday: I really enjoyed Alyson B. Stanfield’s seminar in San Francisco yesterday. She talked about the importance of repetition… of getting your name out multiple times, in different ways. It takes about nine times for a viewer to take action on something. I know many times I need to hear something in a different way, from potentially a different person before I take action. I really appreciated how she personalized her content to us. She shared some of our own blogs and websites and gave some mini-critiques. I personally got really great feedback from her and it inspired me to take action and make some changes. One artist website that she gave kudos to that I really appreciate is the site of Maria Coryell-Martin. Alyson also mentioned some reasons why artists need to blog and two of them are (1) to learn about your art (yourself) and (2) that the process builds confidence. I would say the more often you do it, the more benefit you get. I realize this since I’ve been been participating in Leah Piken Kolidas’ Art Every Day Month Challenge. It’s pushed me in really positive ways. I realize I’m more connected to my creative self, not just about art. I’m thinking bigger and realizing how my life contributes to my art through cooking, exercise, sleep (or lack there of), etc. I always enjoy meeting new people and I was lucky to meet some wonderful artists at Alyson’s seminar including Ellen Rosenthal, Barbara Downs, Deborah Caperton and Heike Seefeldt. Plus, I really enjoyed connecting with artist Matthew Kowalski and his lovely wife and writer Kathy Sterbenc who had turned me on to Alyson’s seminar in the first place. Thanks guys! Ellen signed up for my journal-making class this Saturday at Frank Bette Center for the Arts in Alameda, CA. I’m really excited! 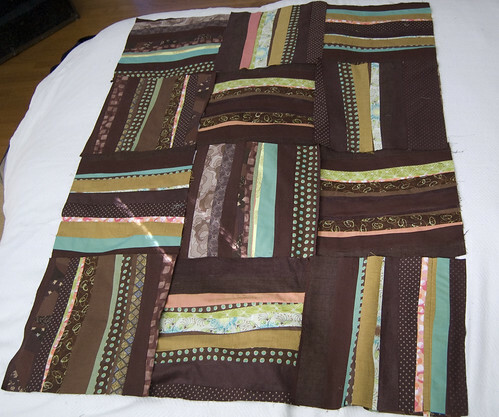 I love the colors on this….brown and turquoise are always a winning combination in my mind. I’d like to see it quilted. Norma, thank you! I will post it when it’s quilted. Nice to have your support. I have a similar experience with AEDM each year, the feeling of connection to my creative self grows and shows up in all areas of my life. It’s a good feeling. Sounds like the workshop was a great experience! Yup, I can identify with the middle tough part! Thanks for sharing your impressions of Alyson Stanfield’s workshop; wonderful posting! Leah: I’m delighted you were able to come to the workshop. It was lovely meeting you! I am always sad when I don’t get to spend more individual time with people at the workshop. The day goes by so fast. BTW, I’m loving your quilt. I’m a sucker for brown + these sherbet colors. Alyson, thank you. Iit was great to meet you as well. I love your honest, direct, personal approach. This is great – I love the free-form piecing and your choice of colors – although I’ll admit I was surprised not to see your signature purple! Finish it – soon, or you’ll end up with a pile of UFO’s… Un-Finished Objects – not where you want to be, trust me!! Carol, thanks! You make me laugh about the UFO’s… yes, I know exactly what you mean. Honestly, I hadn’t done my homework for the class and picked out fabric really, really quickly. I was wearing a striped green scarf at the time and that had a lot of influence on my color choice.